Even though I know where they hang out it can be quite a challenge to find them, for this endemic and highly specialized species is the rarest and most endangered penguin species in the world today. it is estimated that there are fewer than 1000 individuals remaining throughout the islands. 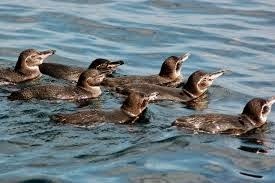 They are also quite tiny by penguin sizes, the third smallest penguin species in the world. Their tiny size is part of the adaptation that allows the cold water bird to live in a warm climate. Our penguins are the only penguins to live on the Equator, and the only ones that live in the Northern hemisphere (except, I have been told by one of my guests, something called the Pittsburgh Penguins). Our penguins are cold water penguins but what enables them to live on the Equator is the unusual intersection of ocean currents that keeps the water, even on the Equator, cold enough for them to survive. They have adapted physically and behaviorally to our warm climate. They have a highly specialized blood system that allows heat to dissipate. Rapid heat loss is also facilitated by the lack of density to their feathers. In fact, their feathers can be affected and even damaged by the hot sun and they deal with this by molting twice a year instead of once, as do most penguins. They also have evolved to have such instinctive behaviors as turning away from the sun, hoping into the water for a cool swim, panting, and finding shady areas for resting in crevices created by lava. Since breeding requires a lot of energy, they breed only when it's cool, by Galapagos standards, in our winter months. Plus, the ocean currents are the most nutrient rich during the colder months. Also, Galapago penguins lay their eggs out out of synchronicity. Most penguins throughout the world lay two eggs at time. Our little guys do things a bit differently. Like the others, they lay two eggs, but not at exactly the same time. Instead, they lay them a few days a part, which gives at least one chick a better chance at survival. This behavior is generally seen in climates they may be inconsistent or unpredictable. According to scientist David Lack, the first egg will be larger and stronger, thus giving that hatching a better chance at survival at times when the food source may be limited. 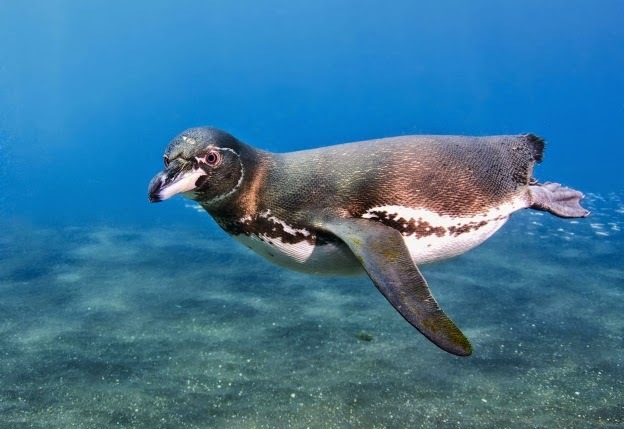 Even with their adaptations, Galapagos penguins are endangered. And that's the factor that is driving many scientists these days to help sustain and even grow the population. One thing that the scientists are doing is helping create artificial nesting sites in shaded areas of Isabela, Fernandina and Bartolome. 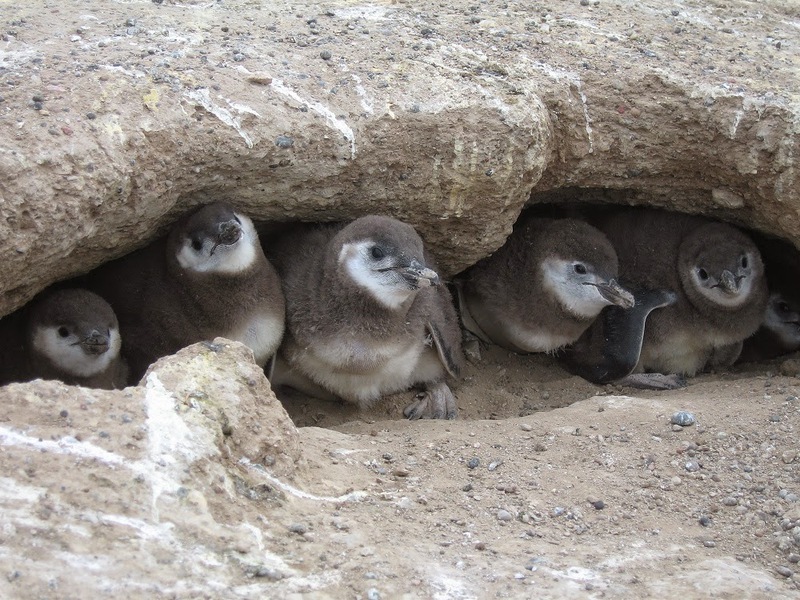 To build the nests, the researchers used the same lava rocks that are typically used by the penguins themselves. The results of the human intervention have been promising and the scientists report seeing several eggs and chicks in the newly-built nests. You can read about this study supported by the University of Washington. 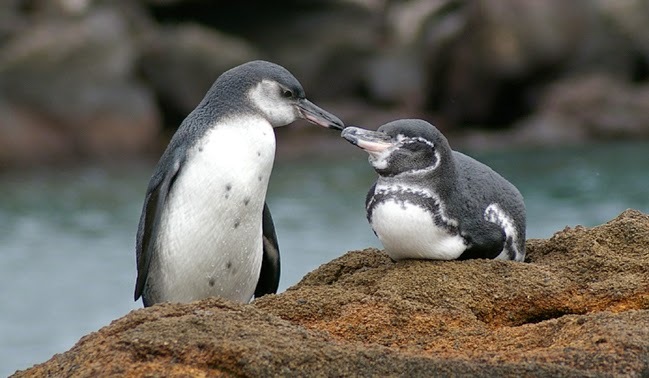 The Charles Darwin Foundation is also keenly involved in monitoring and revitalizing the Galapagos penguin population. One aspect of their study involves following and predicting the impact of global climate change, tourism and introduced mosquitoes and other insects on the penguins. To learn more about these special creatures, take a look at my earlier blog post here.